food, and fighting, and he approaches both with an obsessive pursuit for perfection. He is always immaculately groomed, with a clean shaven face and head. His brown eyes are typical of his Tian (Chinese) heritage. He is in his early 20's. He is a welcome traveling companion, (who really wants to eat dried meat for weeks at a time) and gets along well with his friends. He generally dresses in orange (a throwback to his first class, a monk) and browns. 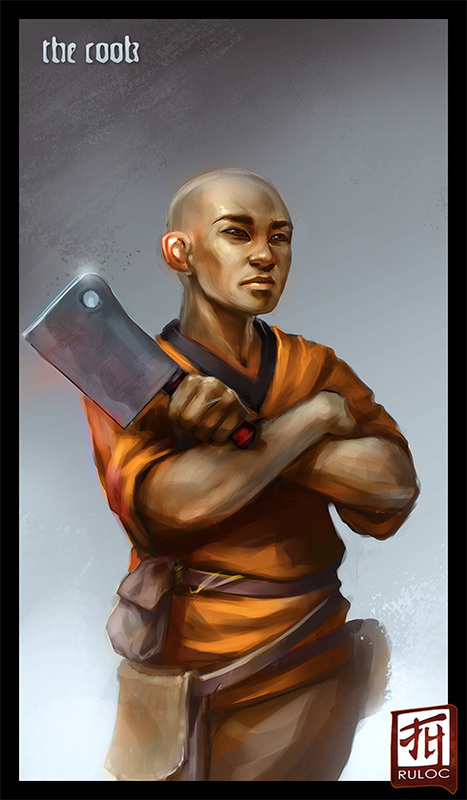 I tend to play martial classes (monk and an archer so far, polearm fighter and dagger rogue will come later) so if he could have a physically capable look to him, that would be great. If you could draw him with a Chinese style cleaver (the one constant in his equipment selection) that would be outstanding. That is perfect! Another great character. Thanks again for doing these. Can't wait to see what you do next!